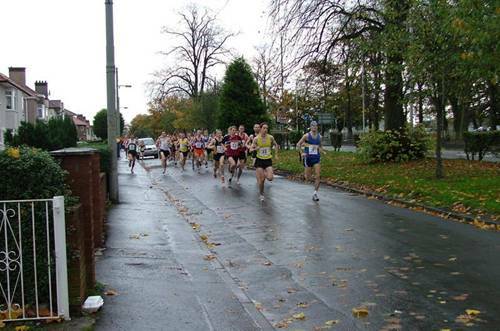 On 28th October 2009 Doug Gillon started his article in the ‘Glasgow Herald’ with the words: “The police have robbed Scotland of yet another classic road race.” The article dealt with the police attitude to the 40 year-old road relay’s traditional route and their insisting that another trail be found for the race. There was no obvious reason for that – the course was on the right hand side of the road, all on pavements with only right hand turns all the way round and had been run without incident since its inception. The ‘reason’ for the demand that they alter the course was that there were two football matches in Glasgow that day plus an Orange Walk! 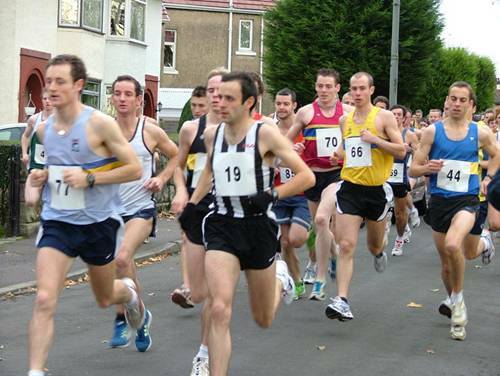 First run in 1969 and won for the first five years by Shettleston Harriers, the host club, it had been won ten times in the period up to 2004, their centenary year. The race was named after Allan Scally a famous Shettleston coach who had come from the ranks of professional runners and never actually competed for the club despite being the main force behind their success in the 50’s and 60’s. He was also the coach to many very good athletes including Joe McGhee, 1954 Empire Games Marathon winner. “After wins at the Lanarkshire and Midland Relays and second place in the McAndrews at the start of the 1969-70 season, it must have been difficult to avoid over confidence at the inaugural Allan Scally Road Relay. Of all the memorial races held in Scotland, none has such strong connections with the person being commemorated. The race started and finished in Camp Road, between two places closely associated with Allan, St Bridget’s School and Maxwell Park. The five mile route, the same as the present trail, went past the Barrachnie clubhouse and the old Gartocher Road headquarters, up the ‘Metal Brae; beloved of so many Shettleston runners, along Edinburgh Road, where Allan regularly targeted runners and invited them to join the club, and passed literally within yards of his home in Dolan Street. As noted above the club went on to win the race in each of the following four years. If the first year was good, the race grew in stature and in numbers thereafter. For those who want the full race statistics, this is the only one where the club has all you could possibly want on the club website – winning individuals, winning teams, fastest times and more – just visit the site and see for yourself. The genius was the timing of the event. Immediately after the war, there was only the McAndrew relay on the road as an indicator for team selection for the Edinburgh to Glasgow and then after 1963, the Glasgow University 5 was used by clubs as the trial for the race and then from 1969 the Allan Scally came along and since it was a relay with stages of 5 miles each, it became what was in effect club selection time for most teams. It also incorporated the Scottish Universities Road Relay Championship and all these factors swelled the numbers. It was the only race with stages of approximately five miles after four relay races of three miles or less and so was nearer the challenge of the Edinburgh to Glasgow where runners would only start level at the start. This drew clubs as to a honey-pot and it largely took over the function of E-G trial from the Glasgow University race which remained one of the classiest races in the country with lots of things in its favour. It is also the only classic race which has all the best times held by its own members – on the old course the fastest time was by Nat Muir with 21:26 in 1985 and the fastest team was their winners in 1995 where Billy Coyle (22:15), John MacKay (22:30), Adrian Callan (21:18) and Graeme Wight (22:15) were the men. I would urge all interested in this race to go to the Shettleston website (www.shettlestonharriers.org.uk) and check out all the details. Meanwhile we have here Colin Youngson’s view of the race. “The Allan Scally Memorial Relay at Garrowhill was named in honour of Shettleston Harriers legendary coach. Traditionally it can after the Kingsway and McAndrew and before the Glasgow University Road Race. These events enabled selected teams to finalise their eight man squads for the prestigious E-G. Despite usually running for good teams, I dreaded the Scally Relay and found it absolutely exhausting. The bustling start followed by a long gradual downhill stretch which endangered suspect hamstrings was bad enough; the brutally steep hill after the sharp right turn was worse; and the energy-draining seemingly endless back straight, usually into a headwind was torture, and then one had to hang on and hope to avoid being outsprinted on the way down to the changeover. The host club were, at the time, the fastest in the land, so a heavy defeat seemed inevitable! On Saturday 30th October 1971 I faced up to this delightful prospect for the first time. Although Pat Maclagan (23:32) moved us into the lead on the second stage, Shettleston had gone into the lead before the final change-over. Lachie Stewart (22:36) had no difficulty burning me off (23:27) but at least VP finished well ahead of third placers Monkland, for whom Jim Brown (22:09) was fastest of the day, with Ron McDonald (2224) second fastest. In 1972, Shettleston won again, very easily from Edinburgh AC and VP. At least I improved a little to 22:59 but that looked dismal compared to the amazing Mr Brown’s new record of 21:52. Andy McKean (EAC) was only six seconds slower and Norman Morrison of the host club ran 22:06. However after five successive victories, Shettleston’s supremacy had faded by 1974 and Edinburgh Southern Harriers had become the most successful Scottish road relay club (although EAC kept winning the National Cross-Country Championship). My new club set a course record for the 20 mile Allan Scally Relay of 90:45. Ian Elliott (22:47) gave us a good start, then with 22:46 I moved SH into the lead. After a marvellous battle, Dave Logue (22:20) handed over level with the flying Andy McKean (22:02, the day’s fastest); but Alistair Blamire (22:52) had no difficulty in moving well clear to secure victory from EAC and Shettleston. Lawrie Spence of Strathclyde University showed his talent with 22:12. By 1977, new stars had appeared – the young lions of Clyde Valley AC – and Jim Brown and Ron McDonald had found a team fit for their prowess. They won from Shettleston and EAC, with Nat Muir fastest in 21:52. However in 1978 ESH won again by twenty seconds from Shettleston. Nat Muir was again fastest with 22:22 but Martin Craven, Allister Hutton, John Robson and myself were strong enough to succeed. Six races for four clubs! Colin, despite what he says about the ‘beastly’ race was like everyone else who ran it over this trail – there were lots of challenges in it: challenges to fitness level, challenges to pace judgment on a difficult course, challenges to racing spirit, challenges to club pride and so on. It really was a pity that the police required a change of trail and that the changing athletic scene reduced the numbers competing here as in all other races. Like the Nigel Barge and the GU Road Race, it is still being run and we all hope that it will continue to be run.